It's finally released after a long wait, check the files section. Read the Readme HERE to see what v0.4 is all about. I have also released the PC version (including source) for those that want the best environment for making content for Kurok, as well as make it possible to create online servers. And I have also updated the SDK files in the files section too. There’s lots of things new to see and explore, including the complete first chapter and especially multiplayer. I have had help from IlDucci, dandi8, Weapon_crowbar and Nembo, thanks for the help! Wouldn't of finished v0.4 without it! I haven’t kept up with the numerous changes since v0.3, so you will have to find them all out on your own ;) Thanks to everyone that joined in the EBOOT art competition. Winner is Brad! Thanks for the help! Of course you can always customise your EBOOT ;) see the other entries in the forums! Please support this project by donating a buck or 2, it will really, really help! I’ve spent a lot of time on Kurok, learning things and making things. You won’t believe the amount of hours I’ve spent on it. Thanks to everyone that has put in donations thus far! The last month I've been working on various parts of Kurok, like colored lightmaps, and adding skybox support into the engine as well as fixing graphic glitches here and there and optimising a lot of things. Like smooth model animation is almost as fast as normal jerky quake style animation now, and open areas that had a lot of sky/water surfaces are now faster to render. Also, I had a problem with fog and skyboxes, skyboxes looked really strange being fogged so I developed a solution to that problem, a very simple but effective one. I basically turn blending on for the skybox polys, set the clear buffer color to the same color as the fog, and also shade the skybox polys with the fog color, and voila, correct looking fogged skyboxes! This also means you can use just the one skybox set of images to do different daytime scenes, like morning dusk, night time and sunset, which saves having to make multiple skybox images just with different shades of color. Speaking of colors, Kurok will look for and load external palette files for the skyboxes so you arn't limited to the standard Quake palette. If one dosn't exist, it will load the default palette anyway. Things are going well for the next update. I've been working on the online portion of the game, making a package for servers to host for online servers. It's a bit rough around the edges at the moment, but its getting there :). 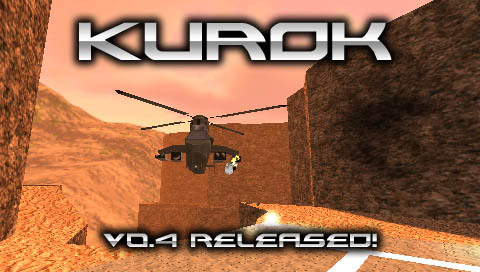 I have also been working on a PC version of Kurok for those that don't have psp's to play it on. However, the game is incredibly easier with the help of a mouse and keyboard, although Insane skill can still get you when you least expect to die. 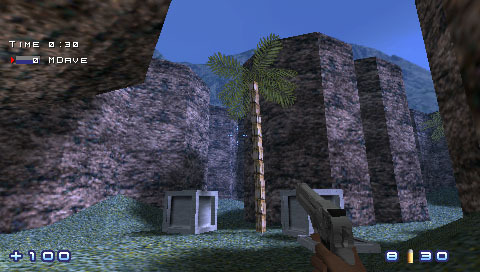 It's going to be based on the FitzQuake variation of the quake engine thanks to its modern feature set, and I'll plug in my own little additions too. 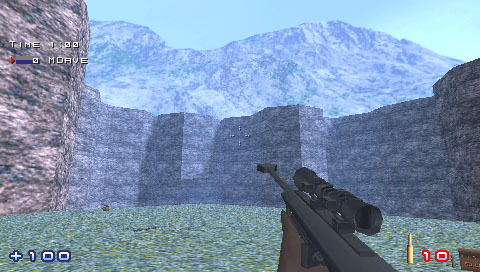 Other then that, I've been fixing a few bugs here and there in the game code, some related to the crosshair and zoom code. I have also reduced the player clip cox from the quake default 32 units wide to 24 units, this hugs the player model more accurately and makes it easier going through some of the tighter hallways in the maps. Because of this change, I've had to make changes to the bsp compiler. However old maps will still work fine, they'll just use the old 32 unit values instead of course. The Kurok forums have seen a large increase in activity lately, so if you havn't joined already what are you waiting for? :) Some good info in there for learning how to make maps. Also in the forums, stranno has been kind enough to make videos of Kurok and upload them to youtube, below is videos from version v0.3 on the psp. I have also put them up in the gallery section too. Enjoy! Here's v0.3! And here is the Changes list and the Readme. It has a lot of bug fixes and new content to play around with, including a recreated single player level, an expansion on another level, and lots of AI and weapon improvements. Multiplayer is now in a very solid state. And its more fun then ever because of the new secondary mode for the rocket launcher. Could it possibly be even more fun to use then the remote mines?! Loading times have been reduced too. Single player has also been refined because of the the weapon balancing, and improved enemy AI :) For engine coders, the SVN has been updated to revision 9 as of this message. Have fun finishing the v0.3 demo! Couple of new things on the Files page. I've uploaded my texture wad I created for making my maps in Kurok, so now you can make your own Kurok style maps. I have also uploaded my edited entity definition file, so you can add the features I've made for Kurok like checkpoints, fog effects, breakable glass, ability to place any .mdl model in your map among other things. Lets see those creations! Version 0.3 is coming along great, I've killed a lot of bugs and glitches in the game, and added quite a lot of new stuff too. One being a remade 'Underground Base' (e1m5) map. Another with redone zoom code. Stay tuned for the next update! Thanks to the amazing feedback I've had over v0.1, I've been working on a bunch of fixes and additions version 0.2 should cover. Here are the changes and fixes for v0.2. And HERE is where you can grab the update. The SVN will always be updated with every new release too. That should keep some going for a little while longer :). Yes, its out now at last, go and grab it HERE! I strongly suggest you check the ReadMe.txt file before use though, so you know how to install it correctly. I won't help those that don't read it ;) It's straightforward enough. If you like it what I've done so far, feel free to donate. Hope you all enjoy it! 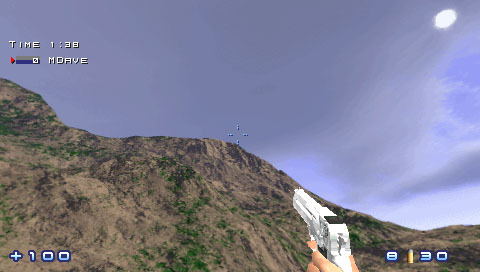 Its rather good fun playing multiplayer deathmatch with friends :D. The engine source is available in the Files section. And all systems go! Thanks a ton to Brad making this site and also making it PSP compatible, make sure to check out his other works at (insert link here). I owe him. This is the start of what will hopefully be a well updated project, which you can find information on at the above About link. For those short on time, its a game using a heavily modified quake engine designed especially for the PSP, and later on if there is enough demand, a PC version. It has one single player episode's worth of content, as well as a fully functional multiplayer mode. 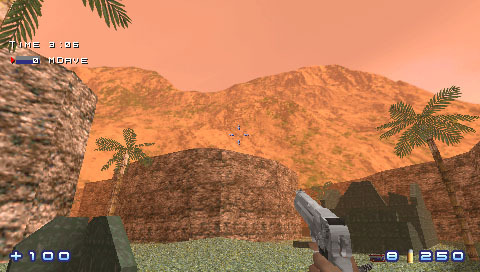 It features some gameplay features in the style of, you guessed it, Turok and Goldeneye on the N64, as well as its own features. I have been working on this little project for about a year now, and I'm glad I can finally show what I have done. I will have a download ready in the files section soon after I polish up some areas of the game, but in the meantime check out the Gallery link at the top to see whats in store. I am accepting donations to help with hosting costs, any generous souls out there that do donate, I will try to come up with something to give them something back, perhaps the latest version :) if I do something like that, it will happen after the first release though. The link is HERE. Thanks!